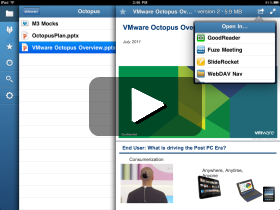 Enable secure, anywhere access to files from any device. Users can share and collaborate on their files with anyone inside or outside the company. Operate on your cloud, either on your private cloud or a public cloud and have unprecedented ability to govern usage. Easily integrate with your existing infrastructure and applications. Are you interested in the beta? Do you want status updates? Enter your email address below and stay up to date with Project Octopus. Copyright © 2011 VMware, Inc. All rights reserved.